You can create drug pipeline reports from Clarivate Analytics Integrity using BizInt Smart Charts Drug Development Suite. Patent data from Integrity can also be used to create charts in BizInt Smart Charts for Patents. You are limited to exporting 1000 records per export. Use the Combine feature in BizInt Smart Charts to combine charts if you have more than 1000 hits. This PDF provides some tips for searching Integrity pipeline records and exporting to BizInt Smart Charts. Conduct your search, selecting the records you want to export, and click the “Export Center” button on the Options menu, as pictured. You will be presented with the export screen. 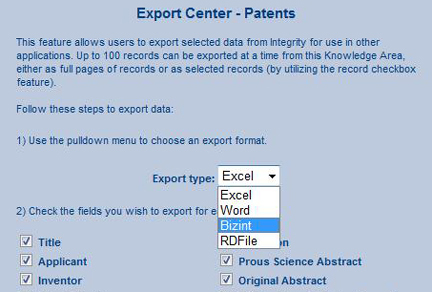 Select “BizInt” as the export type, and “Export”. We recommend that you export all the fields. Depending on how your computer is configured, BizInt Smart Charts Drug Development Suite may launch automatically. If it does not, you will see a dialog from your browser asking what you want to do with the file. You may save this file, to import at a later time, or open the file directly. 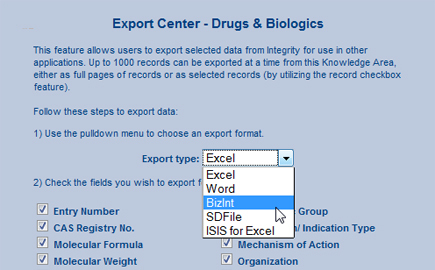 Conduct your search, selecting the records you want to export, and click the “Export Center” button on the Options menu. You will be presented with the export screen. Select “BizInt” as the export type, and “Export”, as pictured below. Depending on how your computer is configured, BizInt Smart Charts for Patents may launch automatically. If it does not, you will see a dialog from your browser asking what you want to do with the file. You may save this file, to import at a later time, or open the file directly.